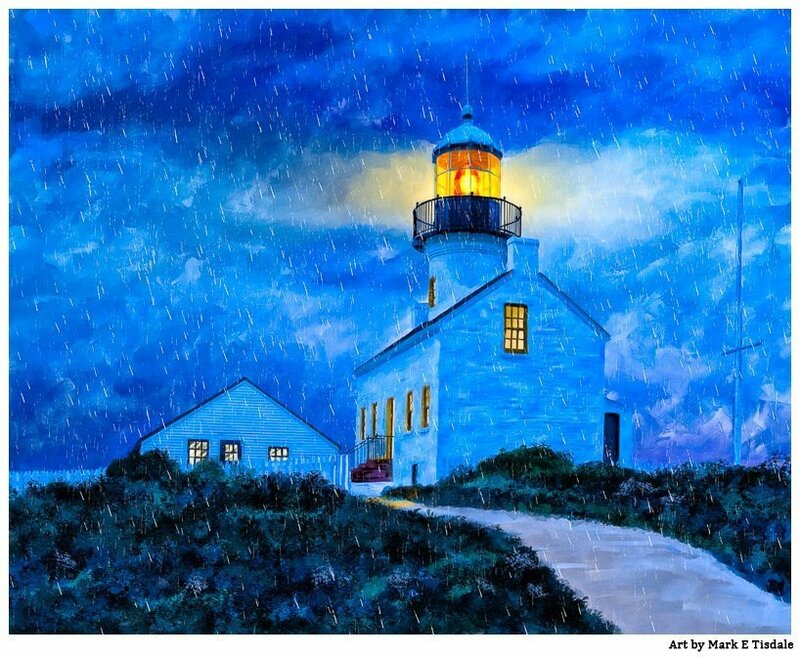 Lately I frequently get art-suggestions like a recent one for the old Point Loma Lighthouse in San Diego. Should I say she had me at lighthouse? There’s just something fascinating to me about old lighthouses, that’s why I have quite a few lighthouse prints in my collection. There’s something about them appeals to me, maybe it’s simply down to their seaside location? But I love those old beacons and I know I’m not alone. I’ve been on something of a bent lately with night time art and rain art. And so, that’s how the old Point Loma Lighthouse at the Cabrillo National Monument came to be featured against a dark and rainy sky! Old Point Loma Lighthouse is often referred to as the old Spanish Lighthouse but its history doesn’t actually date back that far. Construction of this San Diego lighthouse was completed in 1855, but the lighthouse was replaced within 40 years by a new light at a lower elevation. For a period of time Old Point Loma Lighthouse was abandoned but eventually became part of a park called the Cabrillo National Monument. Believe it or not, at one point the lighthouse, which sits on the highest point in the area, was going to be demolished to make way for the a statue to honor Juan Rodríguez Cabrillo. Thankfully the lighthouse was not removed! What a loss that would have been! Today the Cabrillo National Monument of which Old Point Loma Lighthouse is a part, is a landmark in the San Diego area. I researched some of the history of the light before I worked on this artwork, but as soon as I saw the old light, there was something about it that just felt homey and welcoming. That’s the reason for the warm glow in the windows as well as the light itself. It has a feeling of being a shelter from the rain of the rest of the image and gives a great balance, I think, to the dark night beyond. What are your thoughts? Have you visited Old Point Loma lighthouse? Or do you simply love the warmth and romance of historic lights? I hope you’ll pause to share your thoughts! If you would like to know more about prints – see this print in my collection here. Or if you would like to see more of my lighthouse art, see a variety of lighthouse prints in my collection here.